Mad Expectations has a scrumptious selection of handmade chocolates now in store. 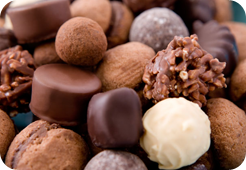 We have named our range of tantalizing chocolates Mad 4 Choccies and have everything from Belgian chocolates to an assortment of truffles and marzipan fruits all freshly made and available in store for you to indulge your sweet tooth. Our chocolatiers can also tailor make chocolate treats as party favours for all special occasions, including weddings, birthdays, Valentine's day and anniversaries.